Teori-praktik One of the more visible individuals in ligthweight backpacking right now is Andrew Skurka. He's done some hikes in later years that most of us just dream of, and he's only just begun. 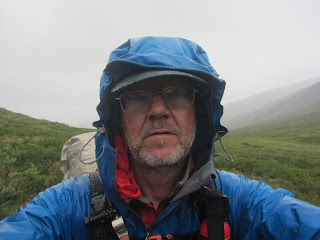 I had the good fortune to have Andy as an instructor on a Backpacking Light course in packrafting recently, and decided that I wanted to know more about him. Andrew started his backpacking career, if there is such a thing, in 2002 along the Appalachian Trail. Since then he's done a number of really long hikes, and he carries very light loads. In 2004-2005 he walked 12 500 kilometers across North America. In January 2007 he tested lightweight gear in "America's Icebox" during a 620 kilometer hike in northern Minnesota. In April 2007 he started out on the Great Western Loop in the US and finished 11 000 kilometers later in November. In the summer of 2009 he hiked and packrafted 1100 kilometers through four mountain ranges of Alaska, and wound down as one of the first non-Alaskan rookies to win the Alaska Wilderness Classic. Jörgen: Andrew, you’re 28 years old and have done an amazing amount of long hikes in the last 4-5 years. I don’t exactly imagine that you’re making a fortune from this, so something else must be driving you. What is that? Andrew: Before delving into the heart of your question, I’ll address your financial assumption since there are many who probably are thinking, “I’d love to have that life but I need to work.” You’re right, I’m certainly not making a fortune from this, but since 2006 I’ve stayed financially profitable by developing a handful of income streams – including public speaking, course instruction, private client guiding, writing, website sales, and sponsorships – that cumulatively have been greater than my expenses, which is of course the other side of the equation and which I fiercely keep to a minimum. Remember, you don’t need to earn much if you don’t spend much. This life works for someone like me – I’m a 28-year-old bachelor who has not outgrown the frugality of my university days and I am proud if I end up sleeping more nights on the ground during a year than I do inside – but I don’t think it would work for anyone who has high lifestyle standards, has a lot of debt, or who needs to support someone other than themselves. Now, regarding the motivation for my trips, I’d say that it boils down entirely to the potential for personal growth, challenge, and reward. I once thought it necessary to wrap a trip into a greater purpose, but nowadays I’m quite comfortable with saying that I do these trips because, in essence, I can and want to – my life is at its best when I’m “out there.” I have a really good civilian life too – I come from a great family, I have great friends, I travel a lot through business, and I am based out of the beautiful state of Colorado – but it just isn’t quite as fulfilling or as rich as my life outdoors. Jörgen: You are carrying very light loads nowadays. That wasn’t always so. Tell us about your conversion and why have you shifted from “traditional” to lightweight gear. Andrew: My first long hike – in fact, my first backpacking trip, really – was in 2002 on the famed 2,170-mile Appalachian Trail. I had never heard of “lightweight backpacking” before, and I definitely had never seen a “lightweight backpacker,” so I started the AT like most people do: with a pack that weighed too much, consisting mostly of worthless items. I think my pack weighed 38 lbs minus food and water when I started. 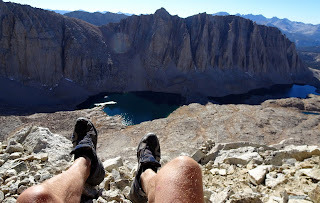 In my first journal entry I started a list of things I was going to throw away or send home as soon as I had an opportunity – the relationship between my pack weight and my hiking experience had become clear by the first hill, and I knew if I was going to hike fast and far, and enjoy it, then I would need to hike light too. Jörgen: When you are advocating lightweight equipment some people say that ultra light gear makes for less comfort and safety than the usual stuff. Have you encountered this and what is your opinion? Andrew: Lightweight gear can be less comfortable and less safe than traditional gear, but it entirely depends on who is using it. Lightweight backpackers are able to carry less because they offset what they do not have with skills. It’s no accident that I call one of my speaking presentations a “Lightweight Backpacking and Skills Clinic” – lightweight backpacking is not just about gear; it’s about skills too. A skilled lightweight backpacker knows how to find comfort with a 3/8-inch-thick torso-length foam sleeping pad by bedding down on a soft layer of pine needles or forest duff; and they can safely camp under a handkerchief-sized tarp by finding a protected campsite and achieving a taught pitch. An unskilled backpacker, in contrast, will be uncomfortable because they will sleep on soil that’s been packed down and denuded of needles and leaves; and they will be unsafe because they will find an exposed campsite and they don’t know how to pitch their tarp correctly, leaving it limp and susceptible to the wind. So, I do rely heavily on my backcountry skills to compensate for equipment that I am not carrying. But there is no reason that relatively inexperienced and unskilled backpackers cannot go light – I would not recommend that they immediately jump to my exact gear kit, but I’m quite confident that they could drop to a 15-lb base weight and have everything they needed and wanted for a 3-season trip. In fact, I’d go so far as to say that no person, however ill experienced, should go backpacking in 3-season conditions with more than 15 lbs. You can squeeze a lot of foolproof equipment into a 15-lb pack: fully enclosed shelter, gas stove, good rain gear, warm sleeping bag, etc. Jörgen: Regarding footwear for short and long hikes I know you prefer light shoes of the trail runner type. There are boots for “demanding expeditions in rough terrain”. Most of your trips seem to qualify on this aspect, so why don’t you use heavier shoes? Andrew: First, I have been a competitive runner since I was 14-years-old so I am biased towards running shoes – my feet feel at home in them. That said, there are many good reasons to wear running shoes for long, technical trips: they are lighter, they dry faster, they breathe better, they are more sensitive (i.e., for scrambling and boulder-hopping), and they are lower to the ground for improved stability. I do not like “waterproof” shoes in wet conditions: they are ineffective in keeping the feet dry (Water comes in over the tops or it wets through; or sweat builds from the inside. ), they take longer to dry out, they are heavier, they are more expensive, and they are hotter and less breathable when it’s not wet. I find that waterproof shoes are fairly effective in dry, snowy conditions (Fall, Winter, early-Spring). I will not say that boots are not necessary, for example, I prefer them for snowshoeing and hiking in snow (when there’s not enough to warrant snowshoes) when temperatures are between 10 and 40 F. But I am still using a lightweight boot – either the Timberland Cadion GTX or the La Sportiva FC 3.0 GTX – and extending the boot well beyond is recommended use; these models are considered “light hikers,” not winter backpacking boots. Boots are probably not necessary for the majority of applications for which people use them – I see many people wearing boots (often waterproof boots) for easy day hikes and for weekend backpacking trips in 3-season conditions. I firmly believe that these individuals would be better served by breathable, lightweight trail running shoes. Jörgen: With a load as light as yours a light backpack seems to work very well, but for people who just recently has started to pare their packweights towards 5-10 kilos baseweight, what size and weight of pack do you recommend? When would you suggest that a person could shift from a pack with a frame to a frameless pack? Andrew: I have to refer you to manufacturer recommendations for this question – there are too many variables here, and the answer will change from person to person. For me, I go back and forth between two packs: since 2004 my 3-season thru-hike pack has been the 50L GoLite Jam; I size up to the 70L GoLite Pinnacle for winter trips, for 3-season trips with large food volumes,and for instructing or guiding. Both of these packs are frameless, and I always cut out their built-in foam pads because I prefer to use my own sleeping pad as a “virtual frame.” As far as when to go with a frameless pack versus when to go with a framed one, if my load is regularly going to be 12-15 kg or more I think it starts to make sense. Last summer I used a framed pack for the for the first time since 2002 while hiking and packrafting in Alaska – but my base weight was 10 kg and I was regularly carrying a week of food (so up to 18 kg total). Jörgen: You’ve been to Iceland, infamous for high winds, and you’ve been to Alaska, parts of the world which are similar to the above timberline and tundra mountains of Scandinavia. What kind of shelter, ie how light, would you choose for this type of terrain and how do you motivate your choices? Andrew: I have had good success with fully-enclosed tarps in both locations – I used a 22-oz GoLite Shrangri-La 2 in Iceland and a 16-oz Mountain Laural Designs DuoMid in Alaska. (The Shrangri-La works well with trekking poles, whereas the DuoMid pitches nicely with a packraft paddle.) I got caught by windy storms in both locations and was very comfortable and confident. The additional challenge in Iceland is the dust that gets blown around by the storms – but I can think of only two good solutions that that (a house and a car) and neither of them are packable. Jörgen: One thing that I find truly interesting and stimulating are your thoughts on “lightweight living/lifestyle”. Could you explain what this is all about? And how could people like myself, sitting in a suburban house with a couple of children and a job, connect to this? Andrew: I’m not ordinarily much of a philosophizer, but I have spent a lot of time thinking about what I want from life and how I can best achieve that. The answer is this “lightweight lifestyle,” which promotes some of the same principles that guide lightweight backpacking – including “Less is more,” and “Simpler, not more complex” – as general life principals, in order to focus more on the one thing that actually leads to personal happiness and fulfilment: one’s relationship with self, others,and nature (and/or a God). I don’t understand why Western culture seems to push this false idea that the pursuit and accumulation of stuff (or “gear”) is desirable, because it actually undermines one’s relationships. Think about it – instead of spending time with our family and friends, in the outdoors, and building community, we are captive to jobs that consume our energy and that stress us out, and to bills for things that we are “supposed” to have like nice cars, big homes, and flat-screen TV’s. The solution seems pretty clear to me: figure out how to spend less so that you can work less, so that you can spend time with the things that are really important to you. I think this quality of life argument is the best reason to adopt the lightweight lifestyle, but another big motivation for me is that it’s also more compatible with my love of the outdoors – my environmental footprint is much smaller because I consume and waste much less. Jörgen: What’s on the agenda for you this upcoming year? Are you going to spend it on a porch somewhere, or will you be going on some other wilderness treks? Andrew: The porch scenario was meant to be a joke, right? Next year I am planning to do another “long” trip, and the most attractive idea I’ve developed is a 6,500-km effort through Alaska and western Canada. This trip is on a whole new level from what I’ve done before: I learned how to go “far, fast, and light” by following the Lower 48’s extensive trail system, and over the last two years I’ve learned how to “adventure” by going to places like Iceland, Alaska, and the Colorado Plateau. This trip will merge the “far, fast, and light” experience with the “adventure” experience – it’s going to be big, and interesting, so stay tuned. Discuss this article here at Utsidan (in Swedish) and below for comments in English. Thanks Hendrik. And yes, there will be a report from the packrafting course shortly.